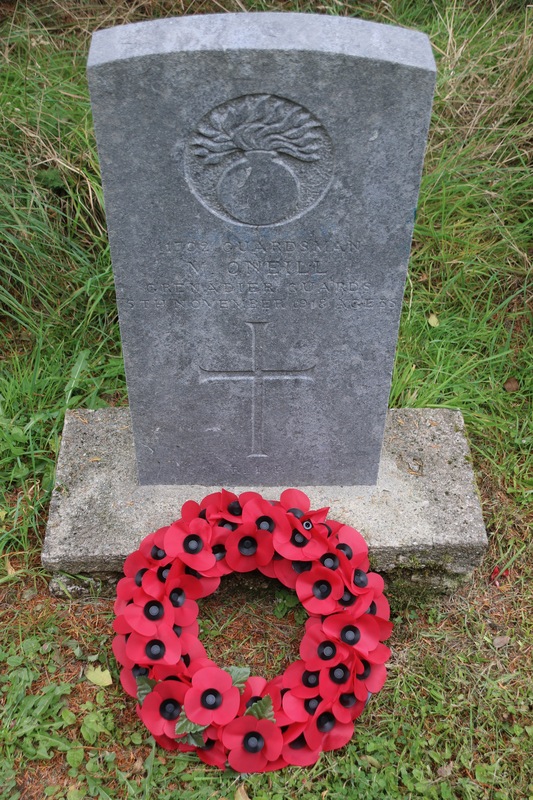 On Sunday, 7th October, the centenaries of both the second wave of the ‘Spanish’ Flu and the approach of the end of the First World War were remembered in a remote and fairly neglected graveyard on a hillside, at Maulinward (Meall an Bhaird), in the Parish of Kilmocomogue, near Durrus in West Cork. The road is narrow with a strong stretch of grass up the middle of it. 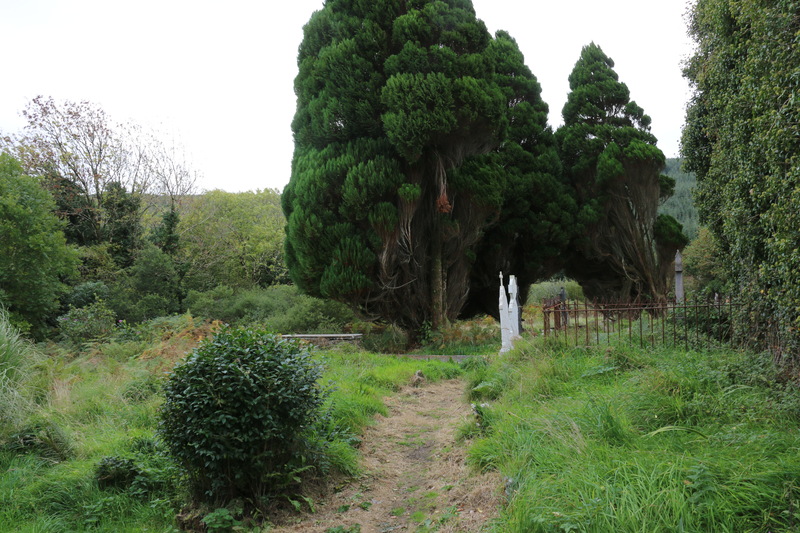 Maulinward Burial Ground, near Durrus, County Cork. It all started when the local rector, Canon Paul Willoughby, told the Bishop, Dr Paul Colton, the very moving and sad local story about Private Michael O’Neill. Private O’Neill came up in conversation between the rector and the Bishop because he was the uncle of a mutual friend: local man Tommy Mullins. In the distant days of the 1960s and 1970s, and childhood holidays spent in that parish, Tommy Mullins was a fisherman who taught the bishop how to fish and to row a boat where he was fishing in Ballylickey at the mouth of the Ouvane River. Canon Willoughby, intends, later this month, to mark the centenary of the end of the First World War by walking the route taken home by Private O’Neill in 1918. The path through Maulinward Burial Ground. Tommy’s uncle, Private Michael O’Neill survived the First World War as a Private in the 5th Reserve Battalion of the Grenadier Guards. Towards the end of October 1918 Michael headed home to his mother’s place at Ballycomane, Durrus. That’s where he was born. 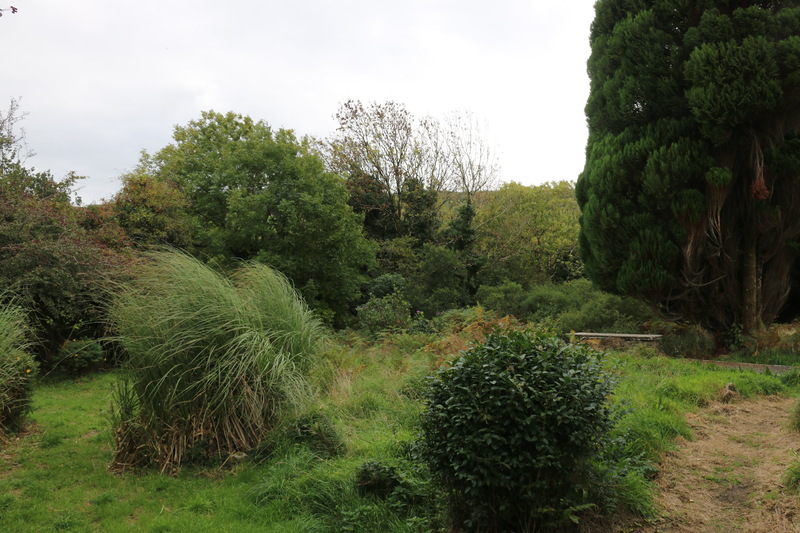 He alighted from the train at the Durrus Road Railway Halt (on the former Cork, Bandon and South Coast Railway’s main line between Cork and Bantry), and walked home to his mother. Five days later he died of the ‘Spanish’ Flu. He was 35 years old. After the morning Eucharist marking the bicentenary of St Brendan’s Church, Bantry on SUnday 7th October, Canon Paul and Mrs Amanda Willoughby, were joined on a visit to Maulinward, by Bishop Paul and Mrs Susan Colton, where the Bishop laid a wreath and silence was observed. 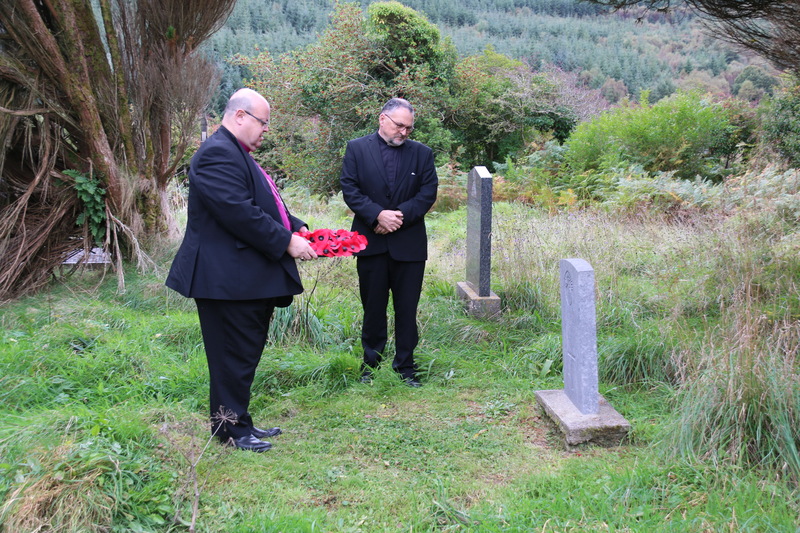 Watched by Canon Paul Willoughby, the Bishop of Cork, Dr Paul Colton, laid a wreath at the grave of Private Michael O’Neill. Thanks to the research of Dr Ida Milne and her excellent book about ‘the Spanish flu’ in Ireland – ‘Stacking the Coffins’ – I learnt an immense amount about the human cost of the flu pandemic in 1918-19, in its three waves of human tragedy. Until I read Ida’s book I did not know that most of the flu victims were fit, healthy people in their prime (aged 25-35), that so many in Ireland died (c.23,000) and that nearly a quarter of the population was affected (800,000); and with estimates of deaths worldwide ranging between 60 million and 100 million, I wasn’t as aware as I ought to have been of the scale of the disaster. Today, I came here to lay a wreath. Yes, it is at the grave of one man, but it is, I think, also symbolic of the remembering of all the victims of the Spanish Flu in 1918 and 1919, and of the First World War. The numbers are great and almost beyond our comprehension but, at the end of the day, the suffering, repeated countless of times, is individual, personal, familial and communal. This is the centenary of a very moving and tragic human story. Scattered around this rural Irish parish there are 31 such Commonwealth War Graves. As well as this one in Maulinward, there are 14 on Bere Island, 12 in Castletownbere, 1 in Rossmacowen (between Adrigole and Beara), 1 at Kealkill, and 2 at the Abbey Cemetery in Bantry. 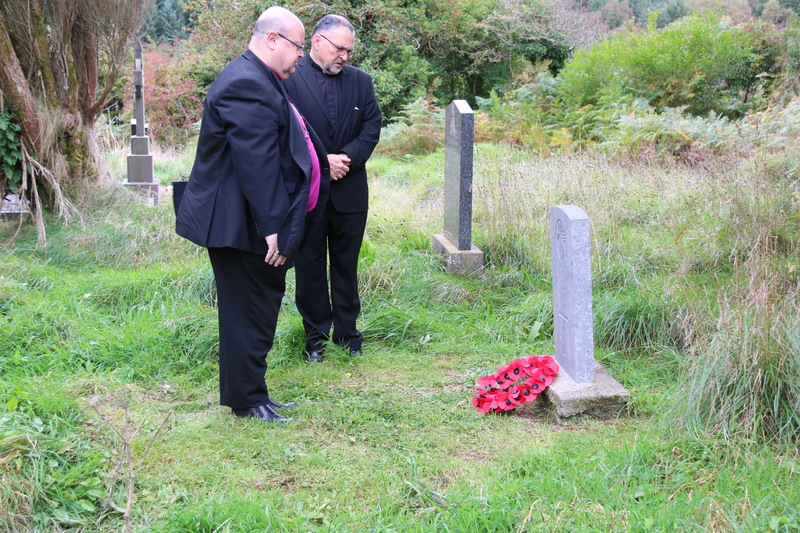 To mark the centenary of the end of the First World War Canon Willoughby intends to visit these 31 graves and to plant a cross of remembrance on each. The grave of Private Michael O’Neill who served in the First World War, made it home near the end of the war and died of the ‘Spanish’ flu. This entry was posted in Centenaries in Ireland, Centenary, Contemporary Issues, Decade of Centenaries, Memorial Service, People from Cork, Remembrance. Bookmark the permalink.